Cabinet knobs are available in a large array of finishes, colors and sizes--bronze, nickel and stainless knobs in shiny and brushed finishes; hand-painted ceramic knobs that include motifs of flowers and leaves; and wooden knobs, to name a few. A knob is generally round and has one screw on the backing, though oblong hardware is also a class of cabinet knobs. Measuring existing cabinet knobs will ensure replacements that fit in the same hole in each door or drawer for a quick installation. Cabinet knobs provide ease in opening doors and drawers. 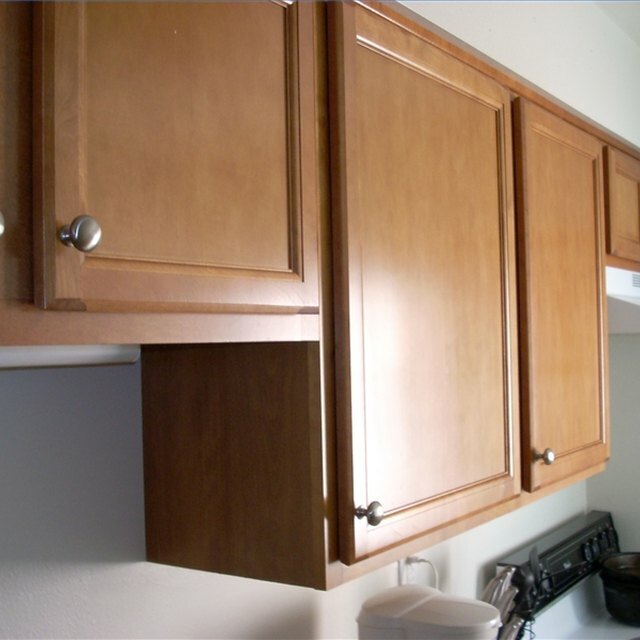 Place a measuring tape on the left side of the cabinet knob face. The face is the part of the knob that is grasped to open a cabinet door. Stretch the measuring tape to the right side of the face and write down this measurement as the cabinet knob diameter. Place the tip of a measuring tape against the flat front of a cabinet door. Stretch the measuring tape straight out away from the cabinet to the back of the cabinet knob. Record this measurement as the cabinet knob clearance. Measure the projection of the cabinet knob by placing the tip of the measuring tape against the flat front of a cabinet door and pulling the measuring tape out to the face of the knob. The projection or depth of the knob is at the farthest point that it protrudes out from the cabinet door. Use these three measurements of existing hardware to purchase new cabinet knobs for doors and drawers. Do Cabinet Knobs Need to Match the Kitchen Faucet?